My Girl is another all time classic, that’s really fun to play on the guitar. You’ll be learning and practicing several fundamental guitar techniques in this lesson, and make great music in the process. The song is played in the My Girl, you’ll be able to guess that the C major is an important part of this song. 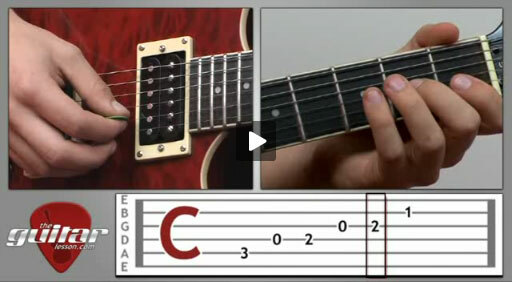 Hopefully the C major will just be revision for you, but you’ll be learning several other new chords in this lesson, which you will arpeggiate, using open strings as well. You’ll also be learning a short strumming section towards the end. All in all, this guitar lesson on My Girl is a short, yet very useful beginner guitar lesson mainly concentrating on chords, chord changes and arpeggios with a twist. My Girl was released as a single at the end of 1964. This was the Temptations’ first big break, and brought the band well deserved attention. The song is the signature song of the band till this day, with a melody that everybody has heard at one time or another. Few people know, that it was not The Temptations that wrote this song, but Smokey Robinson, who at that time was part of the band Miracles. He actually wrote this song after being inspired by his wife, and intended on having his band record it at first. The song quickly climbed to the top of the charts after its release. The song has since been covered by tons of artists, including Michael Jackson, Stevie Wonder, Marvin Gaye, etc., not to mention its musical influence. The most famous cover was recorded by Otis Redding, one year after the song’s original release. Sorry, but you've reached a premium content area. The download of the My Girl tablature file is only available to premium members. Sorry, the same goes for the backing track. To download the backing track to My Girl, please log in and revisit this page.